Cooking has sent me to the hospital twice: first for a deep knife wound across my thumb when I tried to rush through deboning a roast, and the second time for my partner, who was dicing onions when her attention slipped, along with the eight-inch chef's knife in her right hand. We spent a few minutes looking for her fingertip on the kitchen floor before finally finding it, packing it in a container of ice and heading to the ER. The doctor dressed the wound and told us to throw the fingertip away. (Turns out fingers are resilient, and this kind of wound would heal almost as if it had never happened despite its apparent severity.) You never really expect to be tossing a part of your body into the trash on a Wednesday afternoon. I mention all this because it's important to understand that people who tell you how easy cooking is are probably lying. In point of fact, I'm not even sure you should go near a kitchen unless you have health insurance, because I could have bought a new TV and a console to go with it for what I spent to get a half-dozen stitches across my thumb. Even without all the minor burns and cuts, cooking is frequently time consuming and enraging. In that respect, it's just like most of the videogames I love, which may explain how it became a minor obsession. 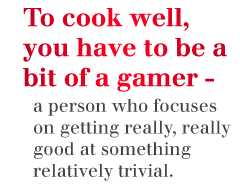 Cooking is absolutely not for everyone, but it's well-suited to gamers. To cook well, you have to be a bit of a gamer - a person who focuses on getting really, really good at something relatively trivial. The kind of person who will spend hundreds of hours of life learning the exact right way to play a Counterstrike map, or who reads strategy guides for games he has already mastered on the off chance he could master it even more. The best cooks exhibit a similar restlessness. They are rarely finished with a dish, instead continuing to revise and refine their work throughout their lives. "Good enough" is a meaningless concept, because it is unforgivable to ignore an opportunity to make something better. In The Perfectionist, a biographical tour of French postwar haute cuisine, Rudolph Chelminski tells a story about Fernand Point. Point was one of the great French chefs of the 20th century and trained many more of them from his legendary La Pyramide restaurant. Those who tried to get a job cooking for him would face his infamous "fried egg" test. Naively, they'd heat the pan, toss in some butter and then crack an egg over it. But inevitably, the butter would start to spatter and hiss, and Point would cry out, "No, no, stop, you unhappy man! You're making a dog's breakfast of it!" Then he would demonstrate how Fernand Point fried an egg.